At times I feel like I have a split personality. Maybe that’s not the right word, but I am divided. Last year, I gave up my sewing space and dropped out of the quilt guild because I had no time. I was concentrating on writing and the kids needed the space for homework. I knew I couldn’t have two demanding interests/desires/obsessions. Now, I have an itch that won’t go away. I find myself in my “old” sewing space fondling a piece of velvet or sorting through my grandmother’s buttons. By some strange course of events I found myself in line at the local fabric store with an arm full of fabrics and trims. I told myself, “It’s for Z-girl’s birthday. It’s not for me.” Let’s be real, it’s for me. I pulled my beloved machine out of exile and grinned. I spent my day off making a costume for Z-girl. It wasn’t fair her sister had a costume for Free Comic Book Day and she did not. Any thing to get the kids to read…right. I thought if I made the costume, the itch would go away. It didn’t. I found myself back at the fabric store with a handful of fabrics and patterns. Now I have a snazzy pink, ruffled apron to wear at work. Like I really need an apron for work. The itch is still there and now it’s spreading. What does that mean? It means I have too much I want to do and not enough time and energy to do it all. I have to find a balance between the two. So while I work on that, here’s a picture of my little Super Heroes. 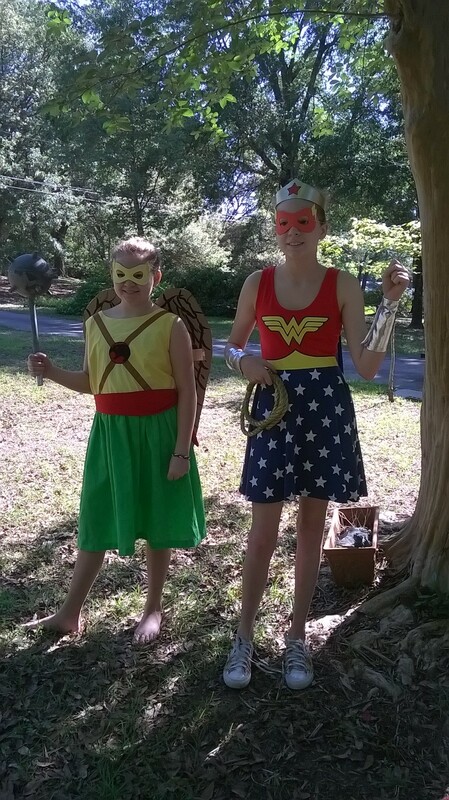 I made the Hawkgirl costume and the mace. This entry was posted in chaos and tagged sewing. Bookmark the permalink. But, I feel your pain about hobbies and writing and trying to find a balance. My balance is I deny myself such things. It isn’t a good one. If you figure out how to do it all, let me know okay? I’ve heard about A-Force and it’s on my list of new comics to try. I can’t imagine working free Comic day, our little store was over flowing. I imagine the staff is worn out.